You'll exude elegance with this sterling silver and rose gold flower ring from Ted and Mag. Custom handmade in fascinating detail, it truly is a work of wearable art. 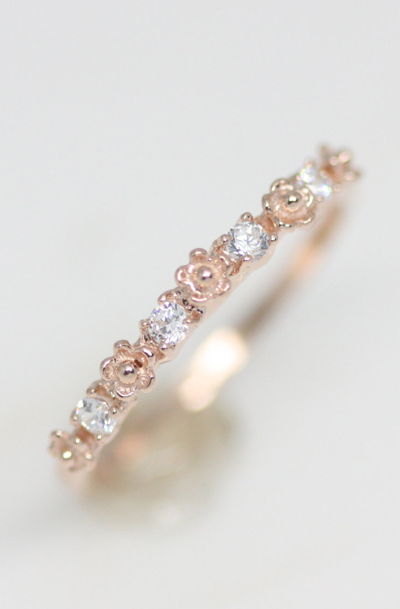 A series of delicate rose gold flowers and high quality zirconia sit on a custom handmade sterling silver band in a breathtaking display of design. It is sure to become a staple in your jewelry collection as it will add polish to your outfit just when you need it most. It also makes a great gift for a friend in need of a little indulgence. It is a limited edition Ted and Mag original. Order now to guarantee availability.